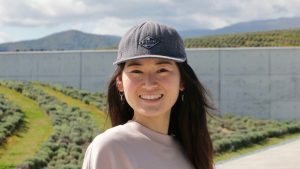 Hailing from Sapporo, Ayami is a true "Dosanko" or Hokkaidian and grew up camping with her family every weekend on the beautiful Shakotan coastline. This taught her to appreciate the natural playground she has been lucky enough to grow up and now raise her three kids in long ago. 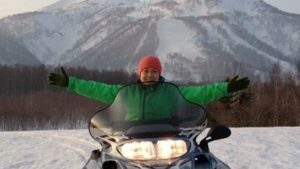 After returning to Sapporo from a year long tour of Australia she met Clayton (for better of for worse) and he introduced her to "winter appreciation" and snowboarding. A natural to say the least, she was hitting table tops litterally the first day she ever stood on a board!? Keeping up to Clayton and more importantly making it down in time for the next tram at Teine hardend her up and brought her to ripping level in no time. Now the mother of three (4 if you count Clayton) children, she’s harder than ever! moved to Japan 16 years later he hasn’t left. 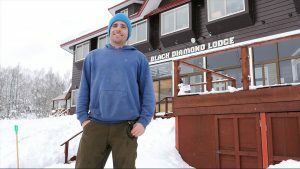 He is dedicated to pushing the frontier of outdoor winter tourism through the Hokkaido Backcountry Club and and Black Diamond Tours. She is passionate to offer Japanese "omotenashi" cultures for visitors come from various fields. 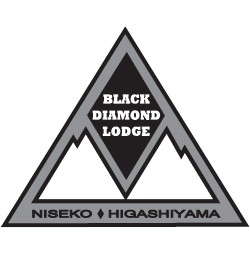 She is also teaching yoga so you might see her somewhere at the yoga studio around in Niseko. Take a class with her to heal your tired body after playing hard on the mountains!